As Charlotte was pursuing her illustration career in New York City, she met up with many well-known artists at the Society of illustrators, such as James Montgomery Flagg, illustrator of the “Uncle Sam Wants You” World War One recruiting poster. The man she would always remember as a kindred spirit was Harvey Dunn. 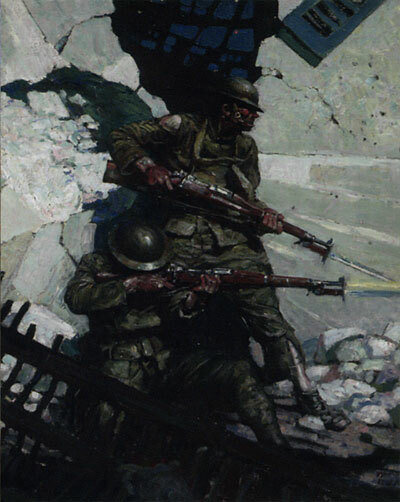 A world War I illustration by Harvey Dunn. The road to a typical New England house–Distant House. It was also at this time that she began to work for American Artists Group, an association that would last for fifty years. 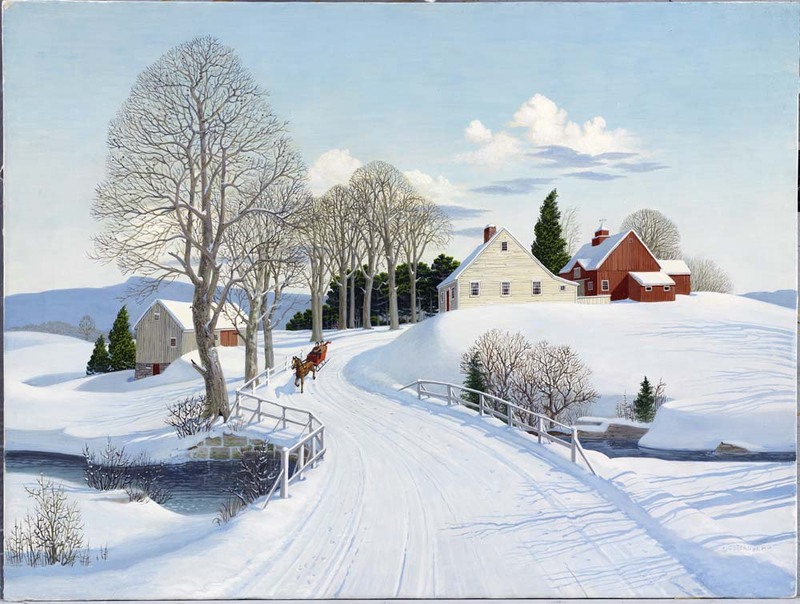 Snowy winter scenes, carefully and lovingly executed in egg tempera, would become her best-known subject. Charlotte’s work looked back to earlier American artists, such as George Henry Durrie, and the Currier & Ives prints. The pleasure she had in completing these paintings seemed to come through in the finished product; her love of the New England landscape, the handsome horses, and the people enjoying themselves. Every year for many years, she completed three or four Christmas card paintings. These were either relatively small pieces done on illustration board, sometimes with a watercolor underpainting, or larger traditional gesso panels, usually 18 by 24. American Artists Group was well-known for its sophisticated variety of cards. Artists involved ranged all the way from the charming Tasha Tudor to the thoughtful Andrew Wyeth. The work she did for this company, more than any other, would put her work before the public eye. People frequently contacted her because they’d seen a card that they liked.